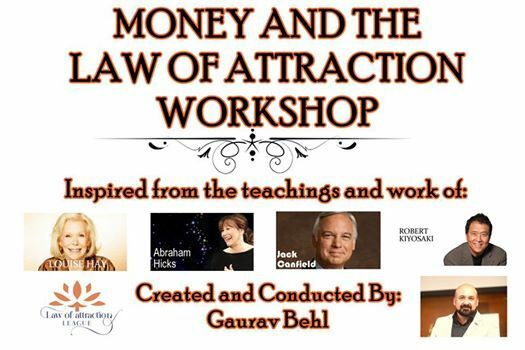 The much awaited Money and the Law of Attraction Workshop premieres for the first time in India! Prebook - Registrations open for the 1st Money and the Law of Attraction Workshop on 6th & 7th April 2019 in Hyderabad. Do you know that 5% of the global population holds 75% wealth of the world? You understand that they know something that others don’t! Fantastic opportunity to train yourself on the *Principles of Prosperity* and use the LAW OF ATTRACTION powerfully to change your relationship with money and open the flood gates of prosperity into your life. 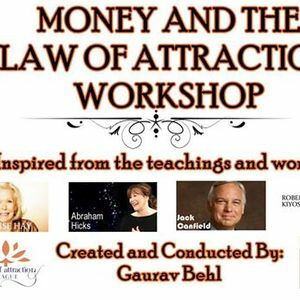 This is an extremely potent and efficacious LOA Workshop put together with inspiration from the works and teachings of Abraham Hicks, Louise Hay, Napoleon Hill, Robert Kiyosaki & Jack Canfield on the subject of prosperity. 1. Become aware of the eternal Principles of Prosperity used by the super rich to attract wealth and take your understanding of Law of Attraction to a new expanded level. 2. Make incredible personal breakthroughs by becoming aware of the blocks to prosperity that you have been carrying subconsciously within, all along, and release them all in the course of the workshop. 3. Get into your Vortex where all the money you have asked for is waiting for you and have an inner vibrational alignment with all the money you have been asking for and allow it to flow effortlessly into your life experience now. 4. Have a deeper understanding about money as an infinite resource, about who-you-really-are, why you deserve to be rich and about Abraham’s teachings on prosperity. 5. Reprogram your subconscious mind and change your belief system by eradicating old, limiting beliefs and replacing it with a new *Prosperity Consciousness* and get into a subconscious state of ‘allowing’ the money to begin moving into your life. Investment: 12000/- all inclusive* (*including Lunch, refreshments, course material and Certificate). ***This Workshop is an Advanced program and not open to freshers to the subject of the Law of Attraction. Read the ‘Law of Attraction’ by Jerry and Esther Hicks. He is a Channeller, a Law of Attraction Teacher Trainer, A Global Heal Your Life Teacher Mentor, "Certified International Heal Your Life Coach" and a Licensed International Heal Your Life Workshop Leader, a Kids & Teen Playshop/Workshop Leader, a channeller and a healer. He has been deeply inspired by the work of Louise Hay- who helped transform his life through a workshop he attended in 2013. He is a professional Life Coach (Hay House) certified in the UK and has been helping people on an individual level as well. In the last 5 years he has conducted over *100 Transformational workshops on Law of Attraction and Heal Your Life philosophy*, the maximum anyone has done in India and assisted thousands of people in making breakthroughs in their personal lives. Gaurav is the only Life coach in India to have been part of a 10 Day workshop with Abraham Hicks in France in 2017 and in Greece in 2018. He is a Life Coach’s Life Coach and trains and nurtures Life Coaches and those who have a calling to assist others in their spiritual journey and helps them in creating successful and gratifying careers in the arena of personal development, life coaching and Workshop leadership. Money is the highest form of spirituality- Abraham. I personally believe that 90% of problems of life get sorted out when you have the money in your bank. Allow me to help you to tune your vibration to that of PROSPERITY and catapult your life to a new orbit of abundance and being really, really RICH! If your life could make you have a desire the universe has the ability to deliver it. If you have been asking for a new level of prosperity and wealth, this workshop is for you. *Looking forward to welcome you into this space of a new level of understanding and awareness about prosperity consciousness and make you a magnet of Prosperity and money and help you live your dreams!*??? Your most incredibly rewarding and enRICHing weekend awaits you!